This was a very interesting idea for a YA novel, but it fails to trust that the YA reader is capable of complex thought. A thousand years in the future, all the major cities in the world are floating on giant rafts, using ocean currents to navigate. A young girl, Sal, meets with a genetic scientist, Jezzy, who has been working on a human modification to give humans the ability to breathe under water … creating a mermaid, essentially. Sal wants to be among those given this new life, but society frowns on it. Author Martin Simons creates some very interesting characters in Sal and Jezzy, and the basic idea of creating a mermaid-like race from humans is intriguing, but Simons rushes through this, and all his other world-building ideas. What is up with the cities on rafts idea? The very title suggests that this is a book about he cities, on rafts. But inside, the story is about a girl and her goal to a new life as a water-breather. The Sal/Jezzy aspect of the story was easily the most interesting, but even this really felt like it was missing something very important. A goal. An objective of some sort, followed by something preventing the protagonists from achieving their goals. These things are not here; not discernible at least. The objective that sticks out in my mind is Jezzy’s desire to see her teenaged, genetically modified mermaids bear young. She believes that their offspring will carry the genetic code to be the first naturally born water-breathers. This could be a worthy objective if handled well, but it isn’t. Instead, it’s just another aspect of a story that lacks focus. I liked the initial concept, and some of the characters showed a lot of promise, but the author doesn’t pick a plot line to run with. Looking for a good book? 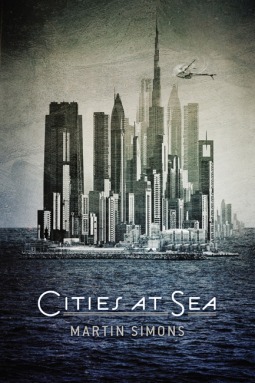 Cities at Sea showed some promise with interesting characters and a rather unique premise, but author Martin Simons doesn’t bring them together in a cohesive manner.